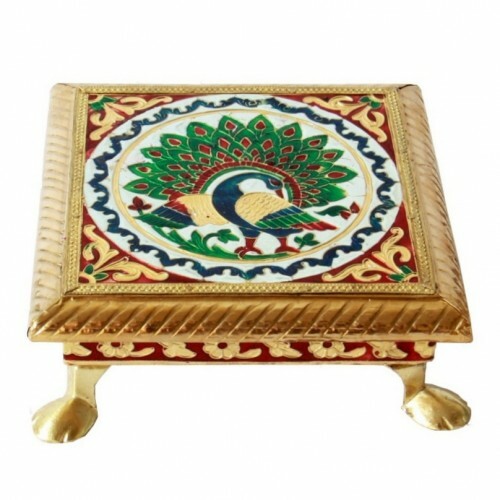 Golden Chowki / Seat- 6"
Golden Chowki / Seat 6" (Golden Meenakari)Dimension: 6 x 6 Inches Approx.Also Avail..
Dimension: 6 x 6 Inches Approx. Also Available Sizes : 12 x 12, 10 x 10, 8 x 8, 5 x 5, 4 x 4 Inches. 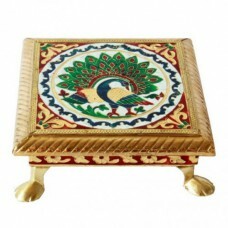 The vibrant colors and traditional designs with floral motifs make this handmade Golden Meenakari Chowki a fabulous artefact of the Meenakari craft, by the rural artisans of Rajasthan (India). The wooden base of this chowki, coated with golden brass sheet, makes it strong and durable. This can be easily cleaned with a wet cloth. Enchanting floral design of this chowki, makes it an aesthetic showpiece also. A preferred gift for personal, festive and corporate gifting.... right choice for all auspicious occasions.